The Child Trust Fund is potentially a very attractive benefit, available to children born on or after 1st September 2002. The purpose of the trust account is to offer children a financial nest egg that should help them as they move into adulthood. While the individual nominated to operate the account is normally a parent, money cannot be taken out by anyone but the child in question. 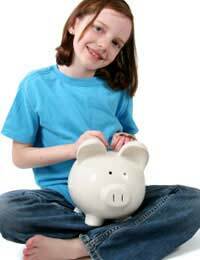 They cannot withdraw any cash from the account until they reach the age of 18. The Child Trust Fund or CTF was one of the major beneficiaries of the 2009 Budget. In an announcement chock full of bad news and questionable financial predictions, the good elements were easily overshadowed. However, the Chancellor's speech made some important changes to the Child Trust Fund that will impact positively on thousands of children. Under the previous arrangements, each child receives a voucher worth £250 to give their account a kick start. This is doubled for children from low income families. Parents and others can then top up the account as and when they wish. The government then adds a second payment of £250 upon the child's seventh birthday. Now, however, the initial vouchers will be topped up further for children with disabilities. Disabled children will be entitled to an extra £100 upon the opening of the account, while children with 'severe disabilities' will receive £200 on top of the initial £250 or £500 for which they would qualify anyway. Even if this cash were not topped up at all, by the time the account matures on the child's 18th birthday it would be worth a not insubstantial amount. The new additions to the scheme have been welcomed by disability charities and by many children's trusts. They are happy that children with disabilities will be better placed to meet the additional costs frequently associated with disability. But other groups, including many organisations specifically concerned with the Child Trust Fund, are concerned that the government is concentrating on the wrong group of children. Regardless of the extra incentives offered to children from low income families, take-up of the Child Trust Fund is very low amongst children from these backgrounds. This is partly attributable to the arguably poor quality of the advertising and education programme instituted by the government about the CTF. Many groups have suggested that a more significant impact could have been achieved if the government had targeted their action towards these families. It is also worth noting that many families do not make voluntary payments to the Child Trust Fund, but rather leave the government vouchers to accrue interest. Again, many CTF providers are pressuring the government to consider new measures that would encourage parents and other relatives to contribute to the funds before the child's 18th birthday. This could take the form of further tax breaks or a government pledge to match additional payments. Finally, it should be remembered that the Child Trust Fund is available only to children for whom Child Benefit is being claimed. As such, you should make sure that you are registered for Child Benefit as soon as possible in order to take advantage of the scheme.